Involves the activities of any snowboarder as a paid professional working with companies and sponsorships as a highly recognizable and marketable asset. The athlete works as a brand representative through filming, editorial, competition, films and image driven projects within the sport of snowboarding (the term usually implies celebrity status, or 'stardom'). The evolution of snowboarding sponsorships and pro snowboarding has been incredible to watch. We have gone through so many phases in such a short time. Early on (like 20 years ago), once the snowboard bug started to catch, the snowboard market went from 2 companies to more than 100 in just a 4 or 5 years. They were all trying for a piece of the expanding pie. Many of those were paying riders impressive amounts to represent out on the hill. Not that it was really that much money, but it was enough for the riders to help fund their riding and partying (not always in that order)lifestyles. It was awesome for the riders, myself included, but hard on the companies. There was this industry wide expectation that you just had to be paying a team to do well as a company. There were lots on paid riders and it spurred on the snowboard lifestyle movement. This is so 1991. Early Rockstar Snowboarders in Critical Condition (1991) by Fall Line Films. Starring Damian Sanders, Shawn Farmer, Dave Seoane, Mike Ranquet, Steve Graham, Nick Perata, Chris Roach, Noah Salasnek, Dave Hatchett, Tucker Fransen... This is incredible history. Watch for Shawn Farmers Rap at the end. I love it!!! During the growth of the sport (1985-1995), it seemed like the energy and cash was unstoppable. Unfortunately, running a company is difficult, especially in a time that the market was changing and growing so fast. The reality was that only the strong front running companies could take that aggressive, paying your team, approach to marketing and stay on the good side of Return on Investment and ahead of the bills. so, many of those early companies only lasted a few seasons. Eventually, the meteoric rise of the sport, the progression of the equipment and the flood of money began to slow and the first of many plateaus hit the sport. Things had to change. Teams were cut back. Riders were dropped. There was always talk of "did she get cut?" or, "what, he switched sponsors again?". It became harder for middle of the pack riders to get funding. Riders had to learn to be more professional and many of the top riders started to hire agents and managers to help them coordinate schedules and relate to companies and sponsorship. For several years, through the late ‘80s and early‘90s, companies and riders limped along, some finding more success than others. The market began to stabilize in terms of technology and snow sports market share, which had grown to around 30-40 percent of skier days. That is astounding considering that in 1980 only a couple resorts nationwide allowed snowboarding at all. It was around this time (around 1995-97), that the mainstream events and coverage began. The X-games hit the air from Crested Butte Colorado. MTV got into it with the Winter Lodge and many other mainstream powerhouses began to take notice. Then in 1998, the first snowboarding Olympics continued to shine a new light on the sport. It was very well received by the media. Popular culture began to follow snow trends. Hip-Hop Stars started wearing goggles and snowboard brands on stage, you started seeing the top riders on talk shows and other more widely cast coverage and publications. Todd Richards was one of the first pro snowboarding stars to really hit mainstream. Thanks for being a motivated rider and leader Todd. From there, growing competition for snowboard company dollars led the pro snowboarding elite towards corporate dollars outside of the snowboard market. It also weeded out what was left of the mediocre athlete making much money. 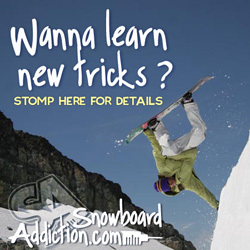 Now moving in a direction where you must be professional and marketable to gain funding, and the leaders of the rockstar snowboarders pack are making a million or more per season. With the success of the US Snowboarding Team in the ’02, and ’06 Olympics, the sport became even more turbo charged in the main stream media. Pro snowboaring is finding more corporate sponsorships and beginning to appear on magazine covers and TV stories from a wide range of markets. Names like Red Bull, Mountain Dew, Target, PlayStation, United, Monster, RockStar, Gatorade, Nike, McDonalds and the list goes on, all getting in on the action. It is amazing for the riders, as they benefit in so many ways from the big sponsorships and mainstream exposure. Pro snowboarding rockstars are shining more and more brightly these days, as budgets for films and pop culture stories boom the riders are ready to rip and represent. They become more and more recognizable to the general public, as these corporate sponsors use the riders names and images worldwide in all forms of media. It has been fun to watch this all happen, but I am even more excited to see what new name or company or event takes it all to a new level again. The one thing you can count on is that it will keep changing, and that there will always be a new and improved supply of Pro Snowboarding Stars waiting for their shot at the money and the glory.